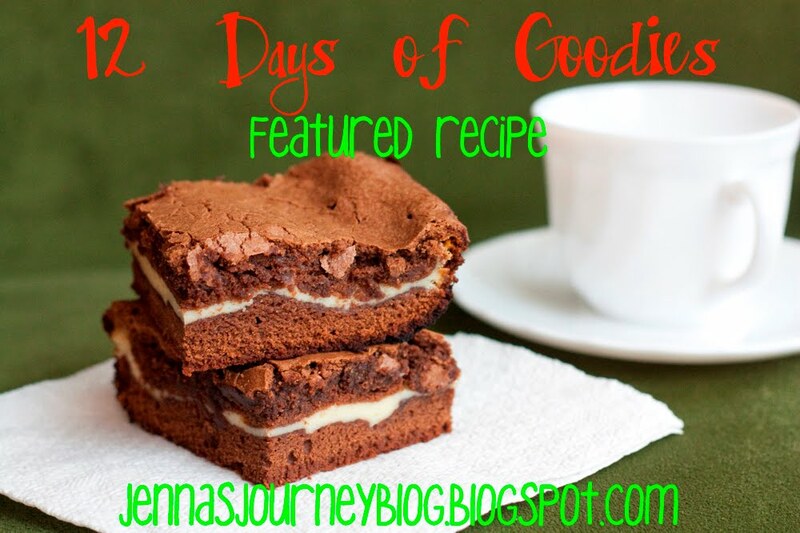 Jenna Blogs: PART 2 - Day 11 of the 12 Days of Goodies! Ready for part 2 of day 11? This recipe is also from my friend Kat! I “discovered” these amazing cream cheese brownies right around the time that Jon and I got married. One thing that you should know about my husband is that he has a sweet tooth (or 20) and I learned early on that he can put away a whole pack of Oreo cookies in one sitting. When Jon and I moved in together, I couldn’t bake but was set on learning. Thankfully, Jon ate my burnt, soggy, and sometimes kind of salty cookies, encouraging me to keep going (the sweet tooth probably had a little something to do with that). Thankfully for him, I finally figured it out, right in time to find this recipe in one of Jon’s old Betty Crocker cookbooks. I’ve been making them ever since – toying with different combinations of cocoa powder, additions of chocolate chips, and substitutions of some of the ingredients for the healthier options. I wanted to share with you the (almost) original recipe for the Betty Crocker Cream Cheese Brownies. I promise you that you will absolutely love the creamy cheese filling sandwiched between the fluffy brownie mix. Heat oven to 350 degrees. Grease buttom and sides of 13 by 9 pan with shortening. Melt butter and chocolate in a saucepan over low heat, stirring frequently. Remove from heat and let cool for 5 minutes. Beat chocolate mixture, sugar, vanilla and eggs in a large bowl with electric mixer on medium speed for 1 minute. Beat in flour and salt on low speed for 30 seconds, then on medium for 1 minute. Spread half of the brownie mixture in pan. Spread cream cheese filling over the batter, then spread the rest of the brownie mix on top. Make sure that all the cream cheese is covered. Bake 45-50 minutes, cool, cut, eat.